…if I do say so myself. Oh and it took AGES. I may write it up or do a YouTube doodah but that will have to wait for another day. I had planned NOT to post today, as I was determined to make a Valentine’s Day card for DH and NOT share it till after the big day, because I can never seem to help myself doing it so he sees it on my blog before then and I have to make a crappy rushed one so he gets a surprise. But no, he decided to be really nice to me and come home from the office early so he could take DD skating this afternoon for her local lesson. And what is in the path from the front door through to the kettle? Yep. My scrap room. 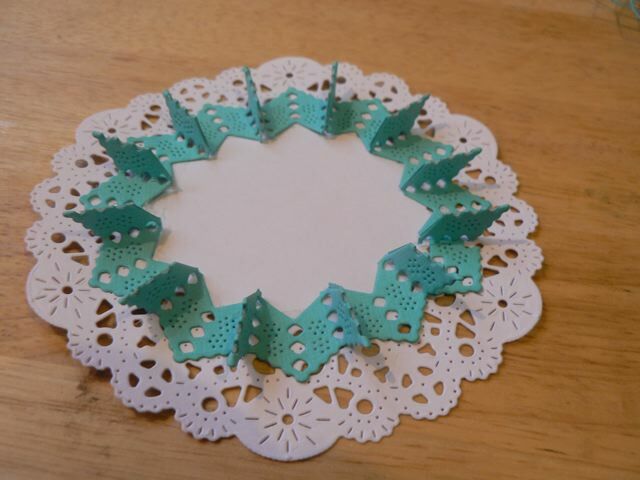 And the card was all over the place, the floor scattered with bits of circles and Nesties in about 10 different sizes, bits of inked card on the table, LOVE YOU stuck to one of them. Oh sure I could have TRIED to hide it but really, what was the point? So there you go, thwarted by kindness. And nice for you as I might as well share it now it’s done. Doesn’t look like much but that is because I was trying to shoot through the little circle windows on each layer… but open? Getting the swirls to have that double layer look was an experiment – I’ve done the stamping-over-distress ink-with water before and love how it looks, but this time I did THAT then stamped over it, not really trying to match the images up perfectly, with Memento ink. I just love it. Working out the circles was a palaver, but in the end it worked out OK.
Perhaps a bit arty for a man-card, but I like arty and DH doesn’t REALLY care, so I please myself. 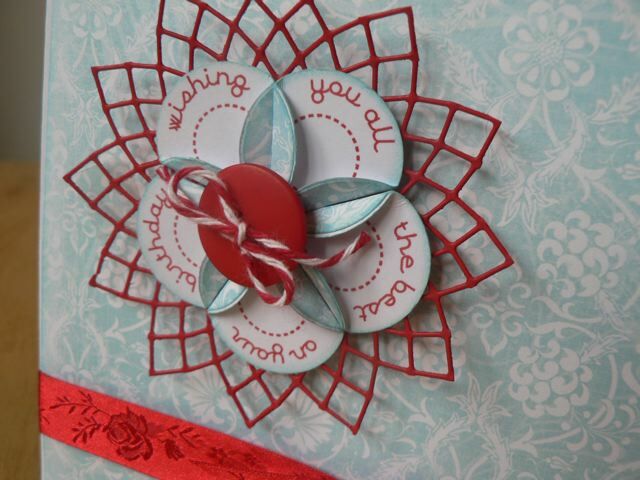 Categories: cards, stamping, Valentines | Tags: cards, stamps, valentine | Permalink. DD is off to the hospital today to have a new leg brace made so I’ll be a bit busy. I will share this little card, super simple, but a different use for my printables from a week or so back. Sorry for the badly cropped photo LOL! 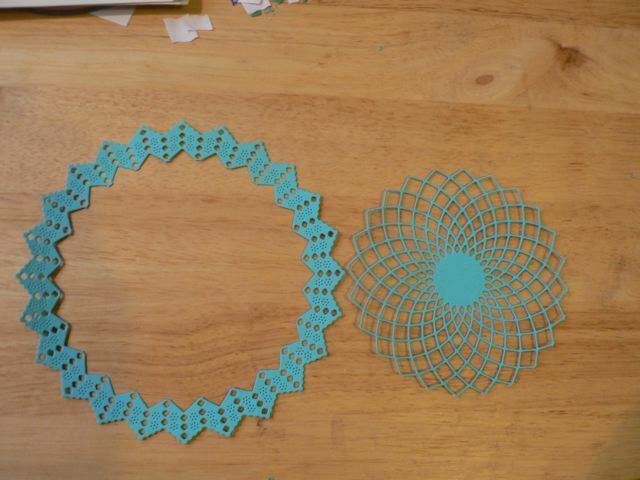 Rather than folding the dahlias, you can line up the circles across a 5″ card like a scalloped border. The embossing nicely echos the circle motif and it is simple and perfect for men – and we ALL struggle with cards for men, don’t we? 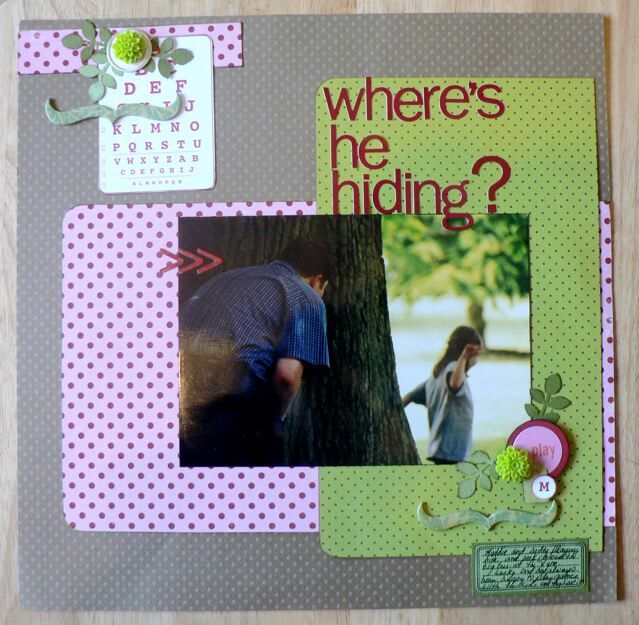 But you could do this with any of the circle printables, even mixing and matching the words, rather than using the Birthday version, of use them all across a scrapbook page as a border, and make them more girly for a more feminine card quite easily. 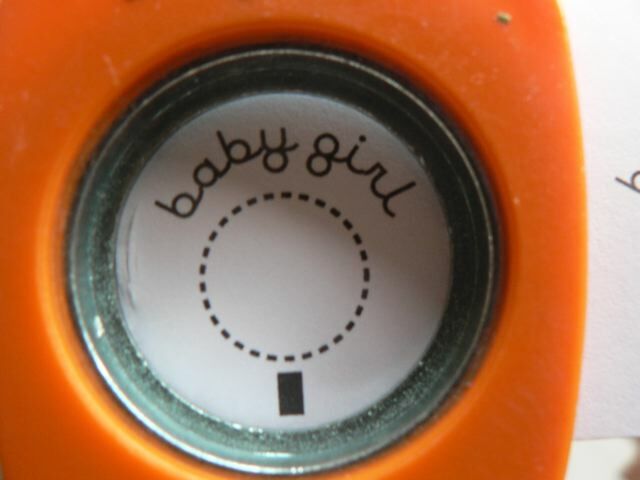 Give it a go – the idea is easy and flexible and endlessly customizable for almost any occasion! Categories: cards, digital goodies, printables | Tags: cards, printables | Permalink. Hello all you WOYWWers. Pop over to Julia’s for the desk hop, but go back a post to vote for your favourite new-look WOYWW badge. My desk? I mess, as ever. I’ve been working hard to clear up months and months of shoving stuff to the side, or piling things up on the floor (indeed, any flat surface) and am feeling the relief and anticipation of a clean workdesk. 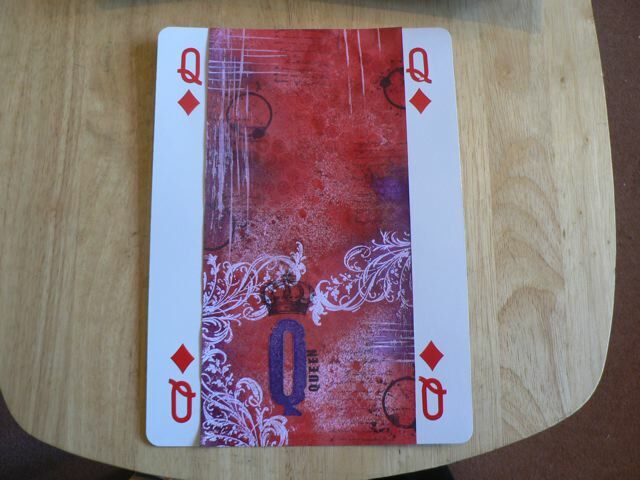 Mostly what is left is the debris from Monday’s post re: the altered mahoosive playing cards. SO much fun, I am fighting the urge to jump right to a new one. But I won’t. I’m sticking to one per week so I can make it last the year and allow new ideas and new techniques to get tested. I find something I want to try EVERY DAY and am determined this project will enrich my crafting, but it won’t do that if I just push on, using the same old tried and true techniques. Another little something to share – at the crop last week it was mentioned that there is SO much going on over on UKS. One of my favourite things is Leo’s Simple Recipes. It really is the whole enchilada, as we say. It’s a colour set, a sketch, a counterfeit kit idea and sample layout all in one. But that isn’t all – one layout appears on the first Tuesday – and that could be with a use-your-stash focus or a new product focus, depending on who’s doing the layout, and then the third Tuesday, an alternate layout using the same recipe. I got to do the second layout this month (as Darling Julia will recognize because I dithered over it at the crop for AGES) and am pleased with it. I’m usually not a sketch person. I recently got Page Maps (used from the Marketplace and a bargain) thinking I might give sketches a go. Really all I ever seem to take from them is photo placement. I find without a kick up the rear I will fall back on tried and true placement and that gets boring. So maybe I’ll find I like using a sketch, even if it is only for where the photos should go. I did follow Leo’s sketch with this one and it didn’t hurt to do so at all! Anyway, here is the layout. Some of the supplies are so old, but I am happy to use stuff up. And seriously, clearing up in my room has reinforced the knowledge that I do not need to buy a single thing other than adhesives to keep creating pages till my deathbed! Between the Simple Recpies, the UKS Art Journey, Shim’s new class, Cal’s Thursday Techniques, and SNAP:2012 (photography challenge) I don’t know what to take on next. Thankfully there is no pressure, and no need to get manic about it (although there is a challenge to do one of each thing to get your name in the hat to win a Daylight light, it’s just for January, then everyone can slow right down) which is just how I like it. Categories: Layouts, WOYWW | Tags: WOYWW | Permalink. What a day I have had so far! I had a few things I needed at the store so I scrapped a thick layer of frost off the windscreen and warmed the car up so I could dash off as soon as DDs bus left to take her to school. I popped to Asda and did my shop. I had a couple of bags of stuff for the charity shop so popped across the parking lot to drop them of. I took out my wallet to show the Gift Aid card, then headed home. At the last-minute I decided to pop in to Homebase for a shelf to extend the large Expidite-like Ikea unit I have – I figured I could go up in height to put some of my items on display where they wouldnt;t reduce my actual storage space. When I go to the register, cue annoyance as I realized my wallet wasn’t in my purse. I went back to the car, assuming it had fallen out on the floor and cur actual PANIC when I realized it wasn’t there. Now it gets weird. There was an elderly man walking past my car while I was clearly in a flap about my wallet. He just stood there staring at me with this smile on his face. I looked at him, simply unable to process why this guy was grinning. He said “I was just wondering what you were looking for” to which I replied “My wallet.” He carried on grinning and walking and I carried on hunting under the seats, in the grocery bags and on the ground. Oh how I wish I had asked him point blank had he seen it! I went in to the store and had a look in the aisles I knew I visited and went to the service desk to report it but there was a queue. I hopped in the car and headed back to the Charity Shop because that was the last place I KNEW I had it. No joy, and now DH was panicked as well. He’s very good about photocopying the contents of his wallet, and I’m not so good. But me losing mine meant him being inconvenienced as well if we had to replace all the cards, etc. Back to Homebase, no queue so I stepped to the desk and asked if anyone had turned in a wallet. She asked my name and pullet it from under the counter!! The elderly man had found it and had literally just turned it in!! OK so here is the conundrum! I can’t seem to decide if I wanted to thank him or give him a slap. He asked me what I was looking for, I told him, he had found it, maybe even had it in his pocket WHEN I TOLD HIM, and never said a word, but waited till I drove away and THEN went to the store to turn it in. In my more generous moments I can give him the benefit of the doubt, as what Brits call a “purse” I call a wallet, and what I call a purse, Brits call a “bag” or “handbag”. So maybe he was confused. But I was CLEARLY in a panic, LOOKING FOR SOMETHING. He had found SOMETHING, and clearly a pretty important something – the kind of something that someone would be in a flap about. Me in a flap, looking for something. Him having found something. If he would have said he found something, asked my name, or what it looked like, ANYTHING, he would have known it was mine and I would have thanked him over and over. He would have felt good about helping someone, I would have had only 5 minutes of panic rather than 20, could have bought my shelf and gone home. But no. In the end all’s well that ends well, I have my wallet (and my shelf) but I will spend the rest of the day baffled by how the situation played out. And wondering if I HAD asked him, would he have handed it over? I have no idea. On a brighter note I finally added the journaling and the title to that layout I posted AGES ago, and have taken to every crop for a couple of months and never managed to complete. I just love the colours and the photo. And I’m glad it’s finally done! I wanted an interesting base to experiment with art-journaling techniques, which is not something I’m really comfortable with. These are BIG so plenty of room to do a lot. The idea was to do one card a week and at the end of 52 weeks I would have a completely decorated deck, and have tried out a load of techniques. I could then, if I liked it enough, turn them into a proper deck of cards. There are places that will take your art and put it on a deck for not a massive amount of money. I’ve always wanted to do that, just never wanted to take it on using just a tiny card. Anyway, I started – and it occurred to me that others may want to play along. Or not LOL! But I am on week three and I thought I would share my progress and see if anyone else is inspired to give it a go. You need one of the massive card decks (although you COULD do it on standard cards that really is quite a small area to work on and I feared detail would get totally lost) and then anything else arty that strikes your fancy. Week one was the King of Diamond. It’s hard to tell but the diamonds at the bottom are embossed and then I dragged a card in black paint to highlight the lines. 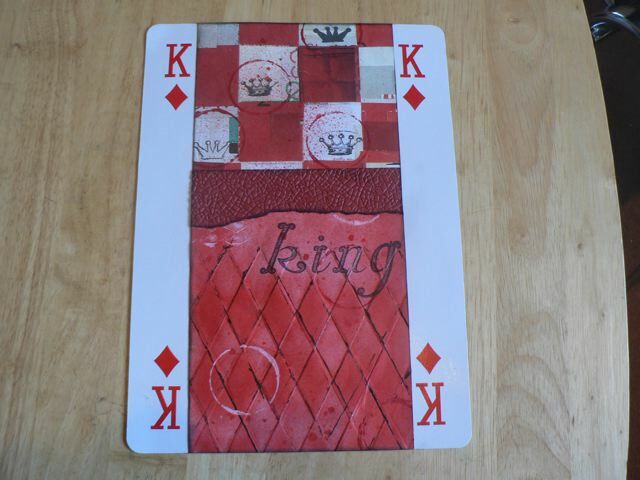 Stamped a few crowns and encircled them with red paint on a milk bottle top. Stamped the word with a stamp I love but never really found a use for. Not my favourite but acceptable for a first go. Next week was the Queen of Diamonds. 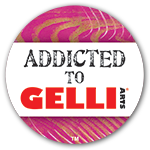 Really liked the swirls stamped and clear embossed then spritzed over with two colours of red dye ink and a bit of purple Cosmic Shimmer. So long as I don’t actually shake the bottle the CS spray acts ALMOST like plain dye spray! Some coffee stain stamped circles and white paint lines, a text stamp (pretty light and hard to see, but it’s there, and a big Q, tiny QUEEN and crown. Better, but still not my favourite! 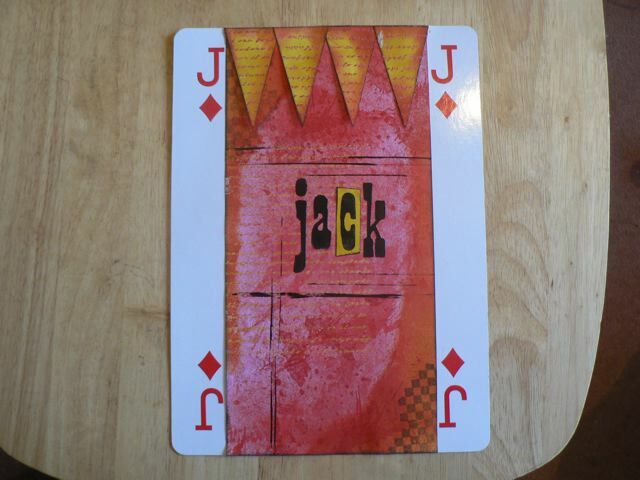 This week was the Jack of Diamonds! Def. my favourite so far. And I can see an improvement in composition and technique so I am happy the project is doing what I hope it would, getting me comfortable with all the various techniques I know about but haven’t really made use of. So next week we move into numbers with the 10 of Diamonds. It’s fun, and I hope I can make the time each week to keep it up because just playing with the supplies and trying out different things gives me a good sense of their properties. I even thought I could switch tracks and turn it into an art journal of sorts, but if I were to do that I think I would not keep the numbers and suit on show but cover the card entirely. So maybe after I finish this experiment I’ll feel like taking to that next level. If you do think you might do something similar I’d love to see it. I’ve not done any SBS photos because there are 1000 (who am I kidding? 100,000) people out there who are way better than I am at this sort of thing. But if I ever do something that I think is uniquely my own, I will share more full. 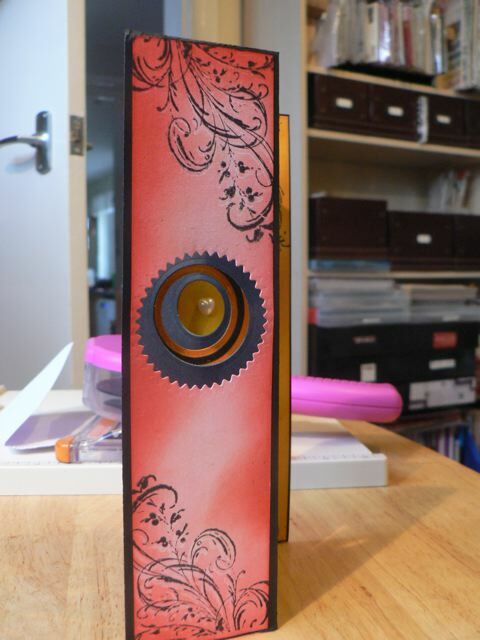 Categories: art | Tags: art journal, cards, stamps | Permalink. Loving this site. I could pin 100 things with ease. If you like watching videos, this is a great site. 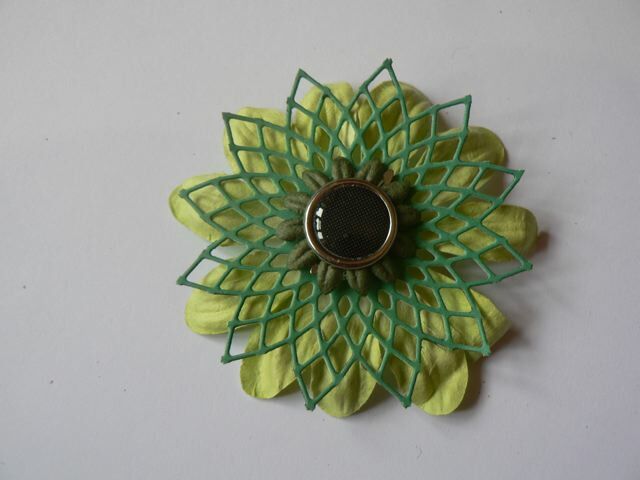 What’s inspiring me today is sewing. I’ve been looking at my sewing station and thinking since I made DS his tee-shirt quilt last year, I really haven’t taken the time to sew at all. Paper is what I love, but fabric comes a close second. Two things that really appeal to me – the easy quilt (and I think I have a charm-pack in my stash that would work fabulously for this) and the little fabric mannequin pin cushion. Both projects have videos to watch and both are simply adorable. 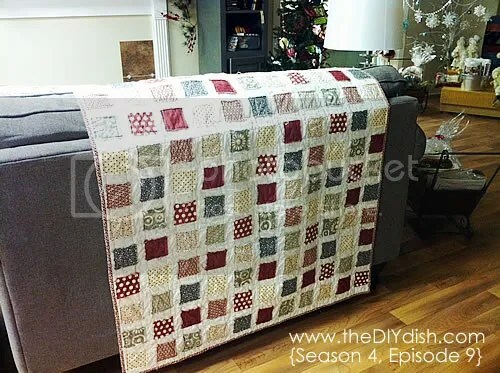 The quilt in particular is just lovely, so very, very simple to do and as you are “quilting as you go” the quilt is basically done when you are are done sewing all the grid lines – you need only sew the binding. She uses flannel but you could surely use fabric for the squares. And it would be very cute using cut up clothing – I always send DDs outgrown clothes to the charity shop but I could see making a quilt like this from some favourites. Like with the tee-shirt quilt, she can have a quilt of fabric memories. And the frayed-edge results gives it a very homespun look. 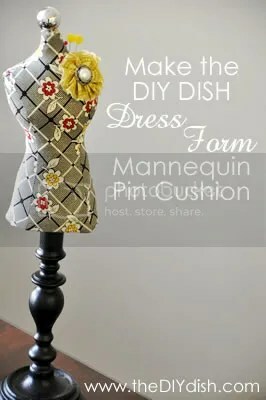 The mannequin pincushion includes a downloadable template with a video to accompany it and uses a small amount of fabric. But don’t stop there! There is so much more to see and learn. Have a look. You will be inspired for sure. 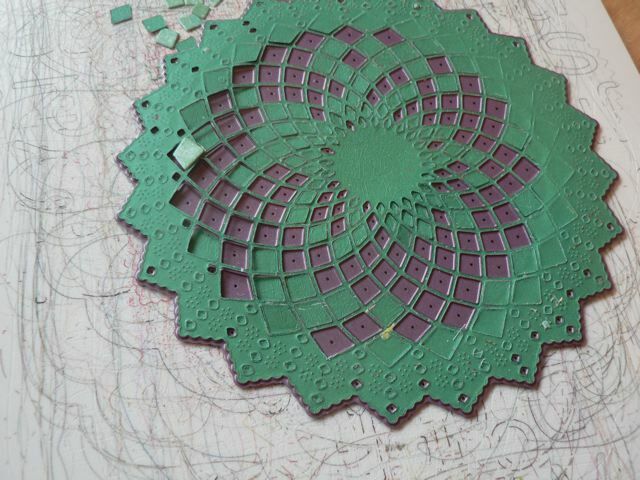 Of course it’s a lot more work to sit and cut the circles, when squares are soooo much easier, but I might still decide to give it a go. Or maybe you will. Anyway, that’s my SSE – I don’t always get around to doing one but I hope that when I do you are as inspired by the someplace-else sites as I am! Categories: quilting, Sunday someplace else | Tags: fabric, quilts, sewing | Permalink. I am still playing with my Cheery Lynn dies. 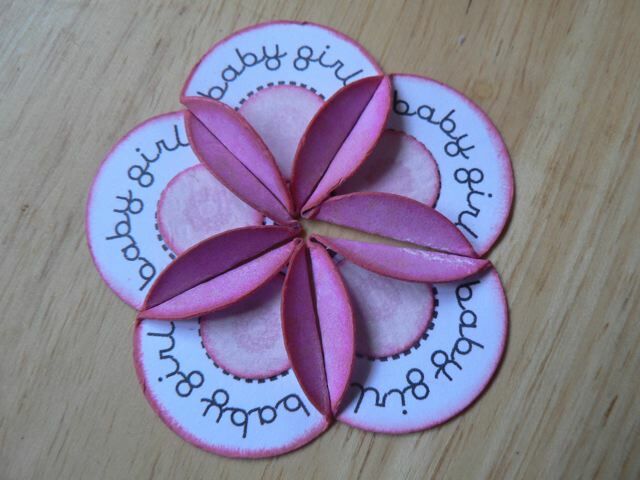 I was cutting bits out, making the flowers yesterday. and I then decided to see what I could do with the borders. 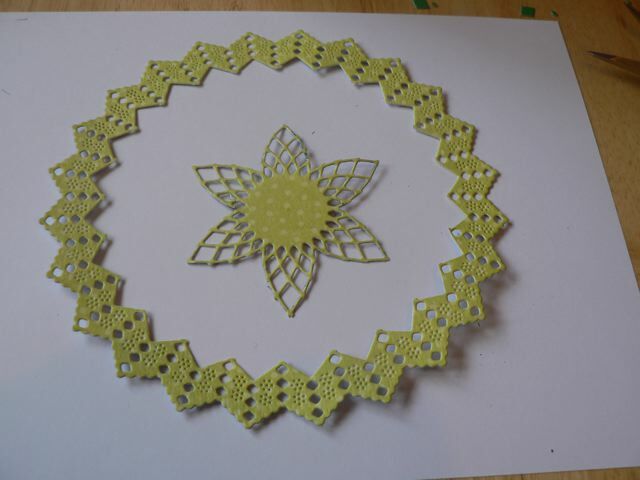 As you can see, if you cut just at the point of the border, sort of straight across the little point, you get both the full center lattice flower and the full border. 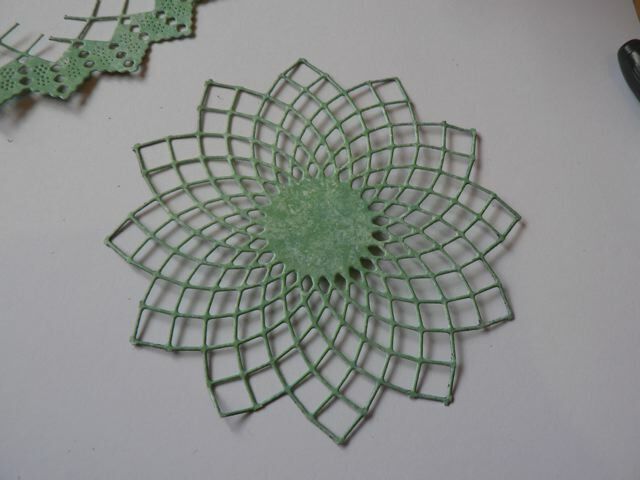 Then cutting a smaller centre flower (a different one to the ones from yesterday – there are so many options for this!) 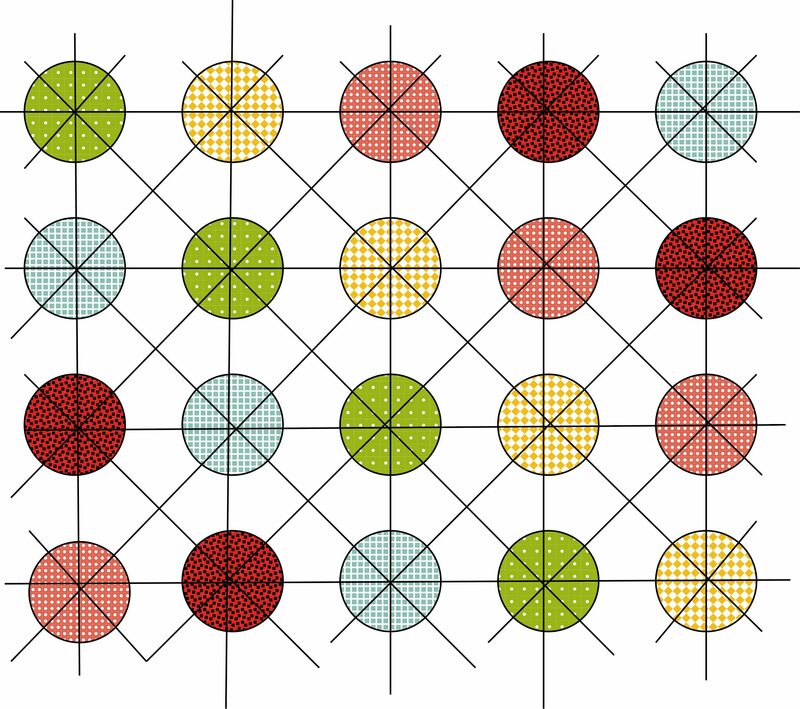 you get a pretty large lattice missing only the middle. 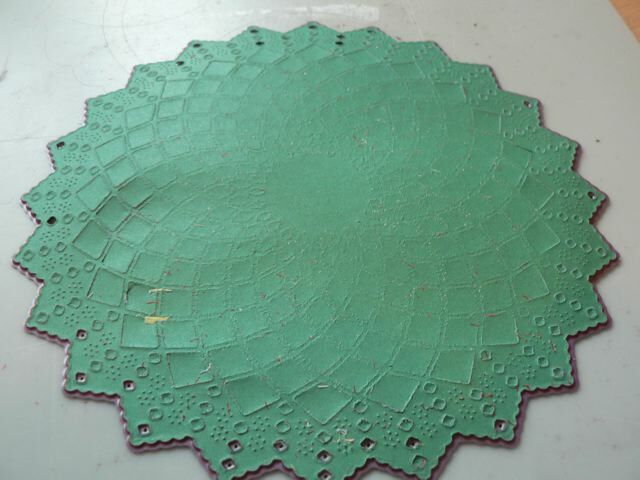 Going back to the border for a moment, if you fold it and stick a pattern (one full chevron, two stuck together) you get another complete circle. I think in future I might cut the strips of tape thinner and add them to one side or the other instead of right down the middle, ad the middle has holes and the tape peeps thru. 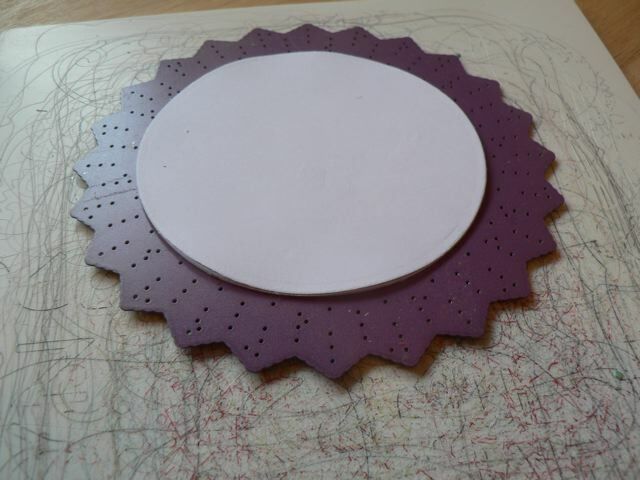 Then you can stick it around a circle for the base. 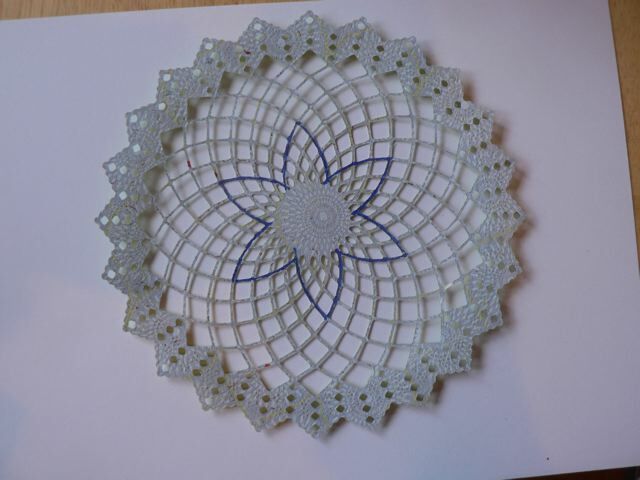 I used the other Cherry Lynn doily die I got for that but a large plain circle works as well! So, from one die cut you can get three items that all work well as card toppers or on scrapbook pages (although the folded border it a bit on the tall side I don’t think it is significantly taller than a rosette, for example. 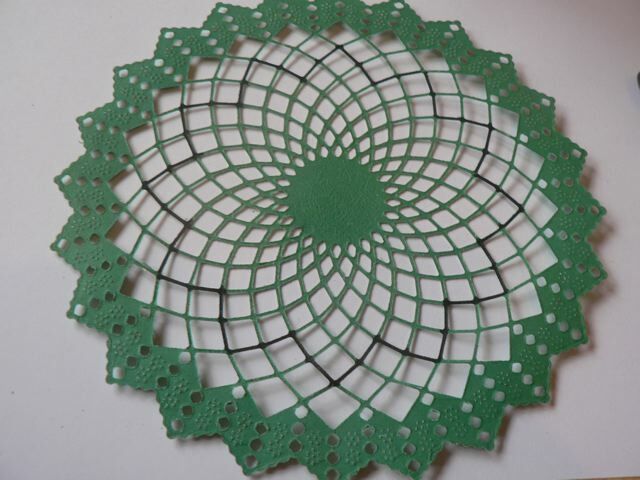 You can see it only takes something large to fill the center of the lattice to make it useful! 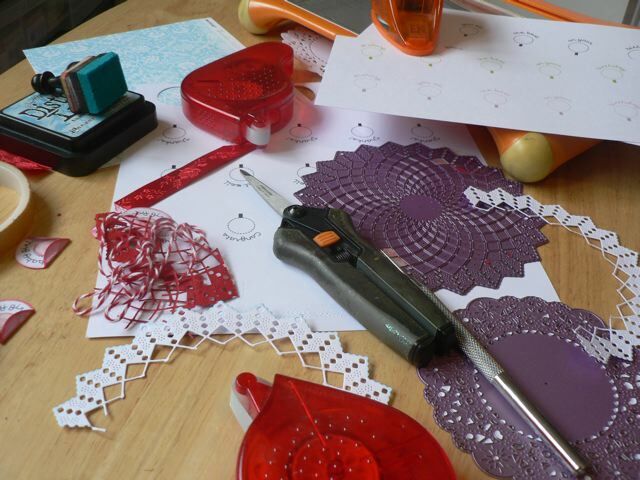 You know me – if I can find a way to use up my scrapping and cardmaking waste, I’ll do it. I just hate throwing useful bits away, especially when they are so pretty. Initially, I think this was my least favourite (of the two LOL!) dies but in the end I have found so much to do with it. I’ll have to move on to the other one at some point but there is too much else on my plate to do that today. 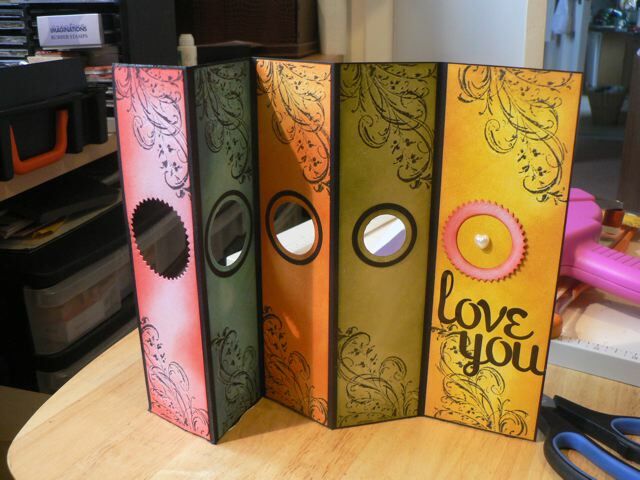 Categories: cards, die-cuts, tips & finds, tutorial | Tags: cards, how-to | Permalink. Hello, hello. Following on from yesterdays post here, first, are the printables. I’ve done them in black and brown and in four colours that I think will be useful. If you are a dab hand at PSE you should be able to alter the colours that way to get a shade you like by playing with the Hue&Saturation option. 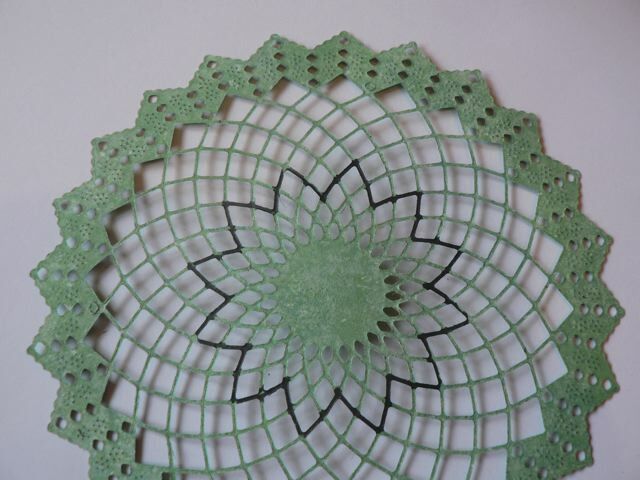 With that out-of-the-way I can move on to the new obsession – the Cherry Lynn doily dies! Such fun. I had a play with them and cutting them on my Grand Calibur. 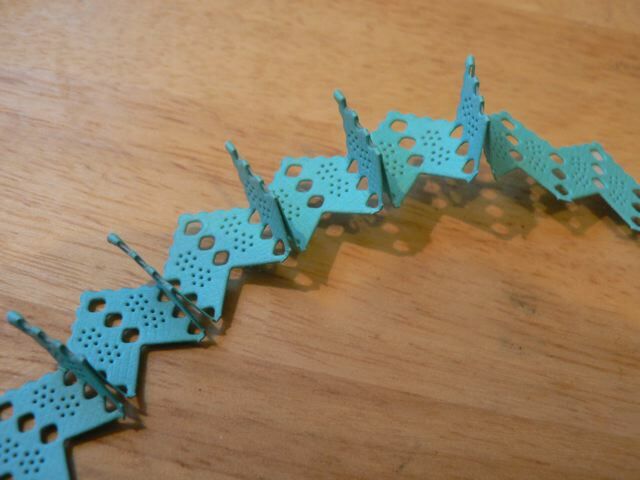 I was looking for a way to cut them reliably and came up with a bit of an idea that works pretty well. First off, I will say that the ones I cut at the crop with Julia’s Big Shot cut with less faff. I did have to rotate the dies once, and I did use a couple of paper shims, but as the cutting plates with the GC have to be removed from the machine and the top one removed to rotate, there is more chance that the die will shift unless you actually tape the paper that will become part of your final die cut. Not ideal, by any means. 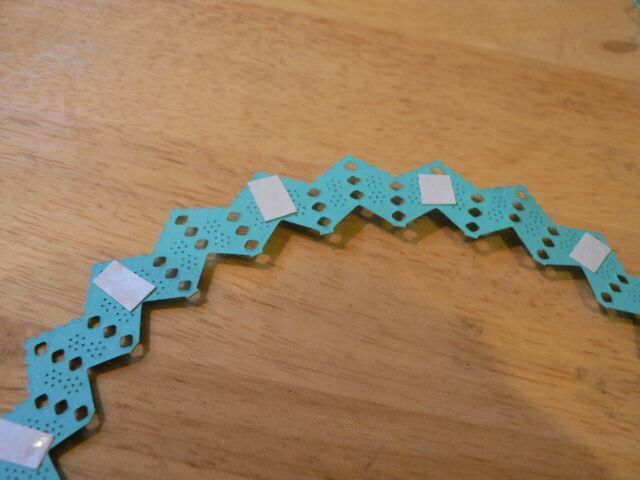 So I made myself a custom shim – a series of cut circles, stacked and stuck. It will really depend on you machine, what kind it is, where the sweet spot is, and how thick a shim you need to make sure it cuts well without forcing the machine gears. Only trial and error will help with that. 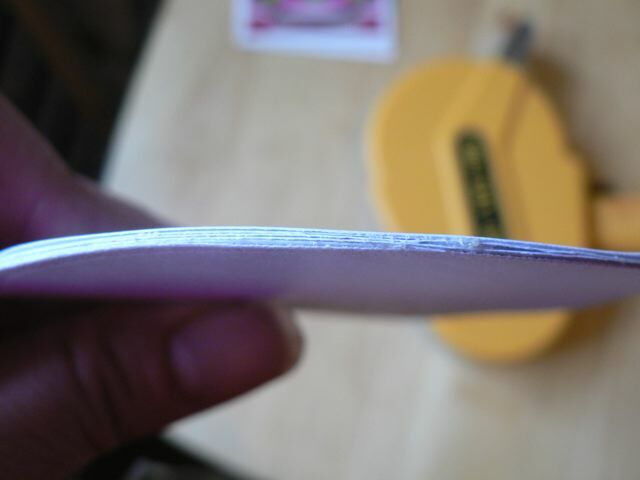 Start thinner (maybe three thicknesses of 160gsm card or 2 of 240gsm) and add layers till you hit the right balance. 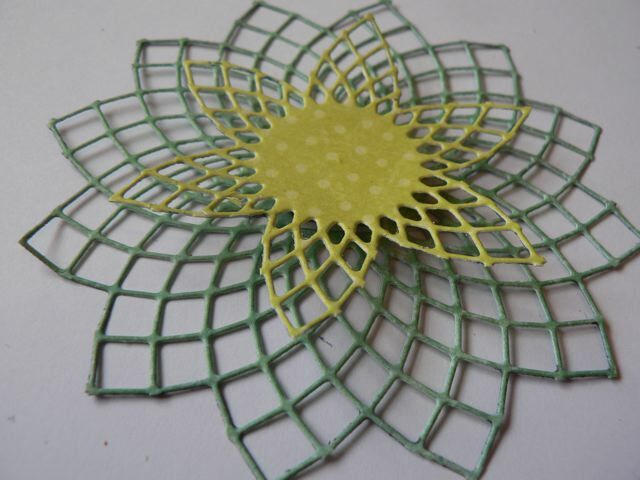 You can also do one the size of just the middle or one that is bigger, right to the edges. I have both. 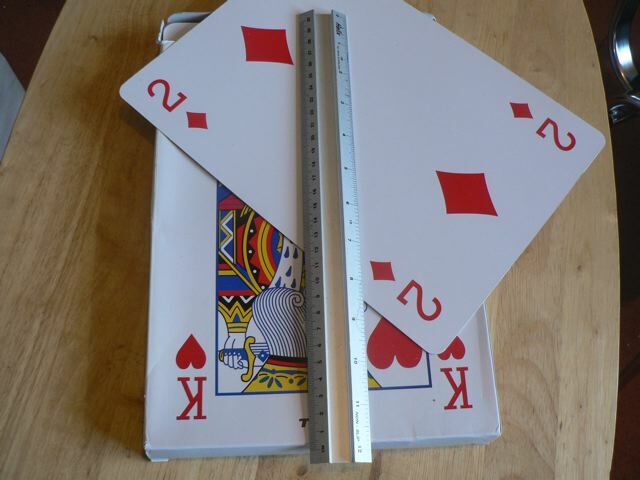 I use both, depending on the thickness of the card I want to cut. Putting the shim only over the tricky areas, roll it through again. I roll forward, then crank back. Usually that does the job. You can see the middle bits are fairly falling out. The ones that aren’t drop out if you tap firmly on the back with something like the handle of your pokey tool. some of them LOOK like they are well attached but they aren’t. 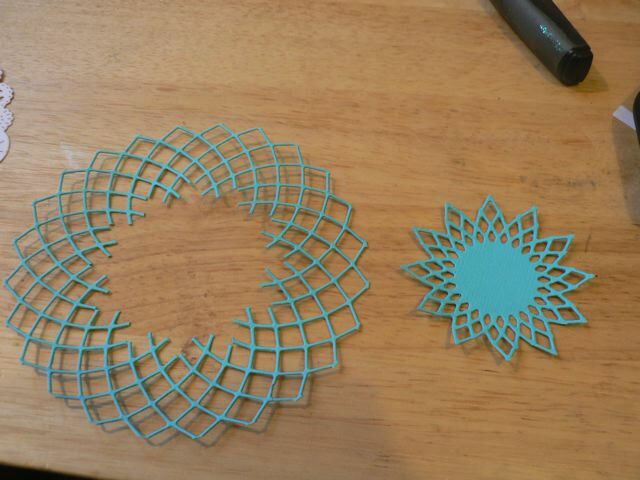 Now let’s cut a lovely lattice flower! Pick your lines – I used a pen so you can see them but you should use a pencil so it doesn’t show on the front. It looks a little deceptive because the card was double-sided and the design is slightly off-center, but you can just see my pen lines to show the cutting. Cut carefully and you get this. and see the pretty frame you get by cutting just the border circle edges? and a third, bigger and fuller. Maybe my favourite. Once you get into a rhythm the cutting is easy, but you can’t let you attention wander or you will make a wrong cut! This is totally my fave technique at the moment. I’ll do a quick YouTube slideshow, but nothing more than the photos here so if you’ve seen one you don’t need to see both. 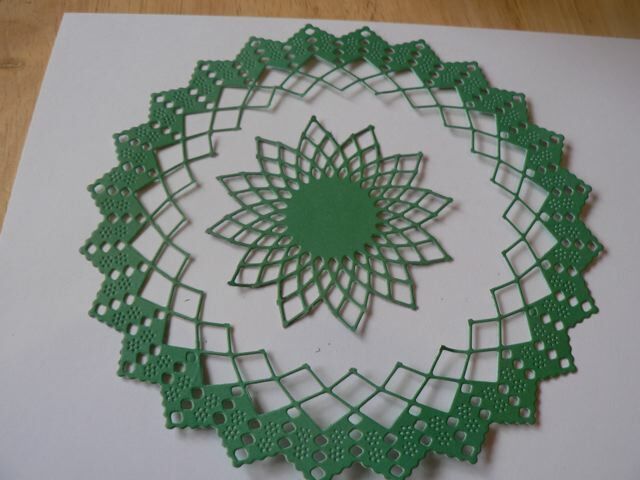 Now I wish I had about 10 more doily dies to play with but alas I only have two and only one is appropriate for this technique. Ah well…. Have fun with it. 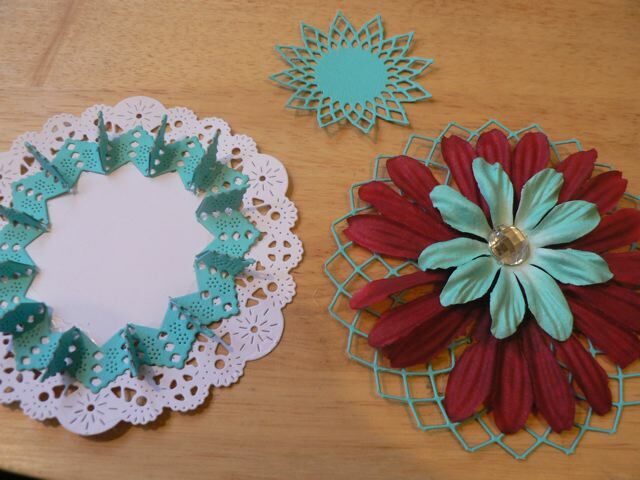 I think they will make lovely card toppers and layered will be so pretty on scrapbook pages. 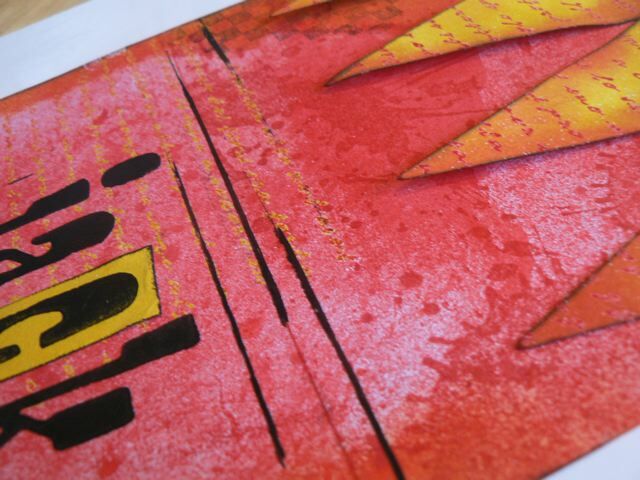 I think I may experiment with swiping them with embossing ink and heat embossing too. Might be really pretty with that or with my brayed glitter glue trick. I just love it when a product has so many uses, and all so interesting. The dies were expensive, but worth it for all you can do! 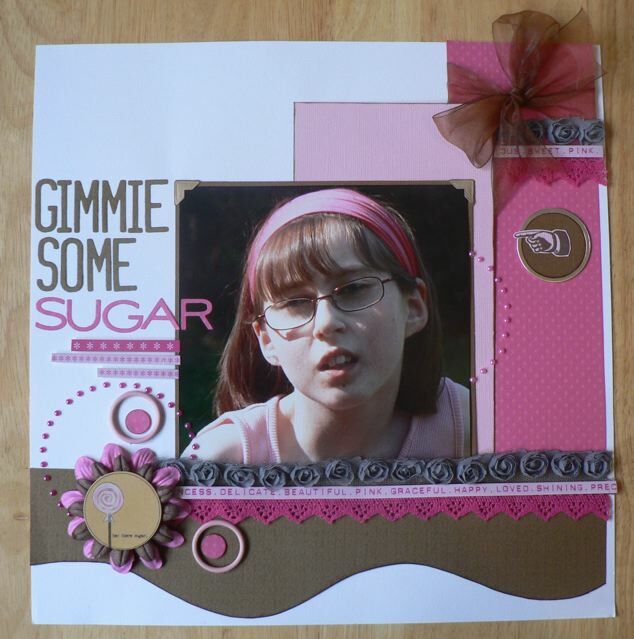 Categories: cards, die-cuts, digital goodies, downloads, printables, tutorial | Tags: cards, how-to | Permalink. Hello again to all the WOYWW visitors. Hope you will find the time to pop over to Julia’s place and see all the other workdesks. If you never have gone on a WOYWW hop, you’ll love it. 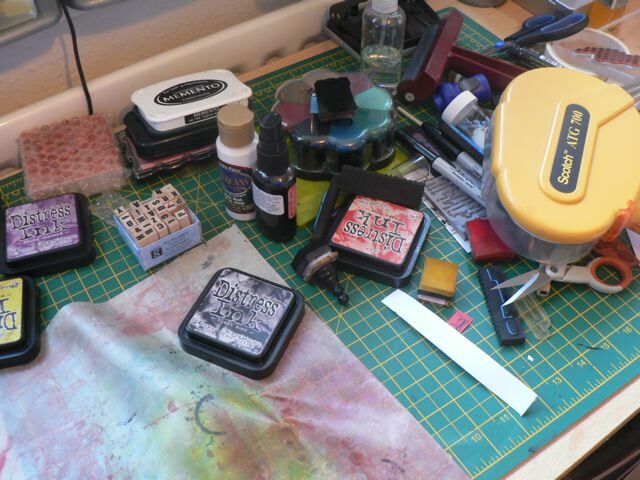 Now, what IS on my workdesk today? A bit of a mess on my satellite table, actually. I tend to come up with an idea and work it to death. 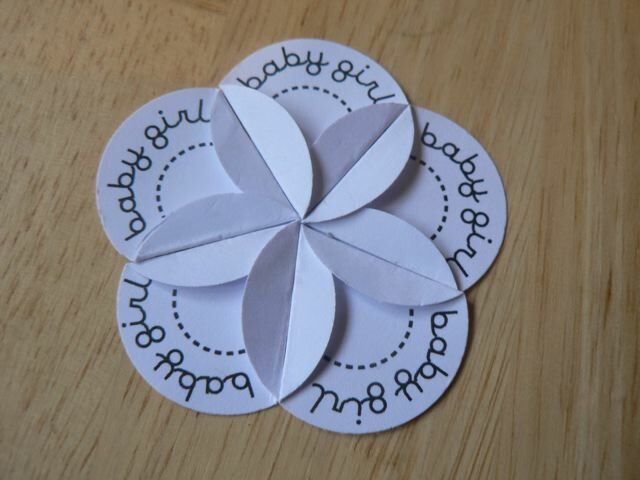 My petal printables have been so much fun, but I feel like I am nearing the end of my interest in them. I’ve done a couple of sets and so many samples, that doing too many more would begin to feel redundant. I am playing with a sample I created yesterday from an idea posted in the comments a day or so before. FruitySuet fom UKS suggested making some with a phrase, spread over the different petals, a nice extension from the Love & Marriage ones. Great idea! Had a think and came up with WISHING/YOU ALL/THE BEST/ON YOUR/BIRTHDAY. Five groups, five petals, and size-wise the words work. I made a strip and printed them and made a card. 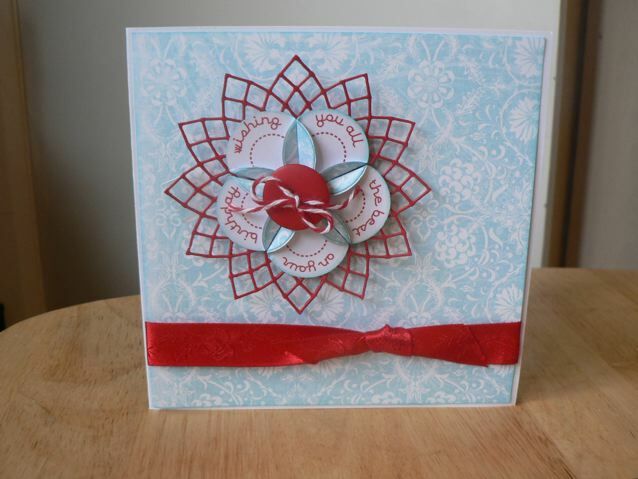 Love the colours (blue, white, and red again) and again with the trimmed down doily die from Shopkeeper Gal. 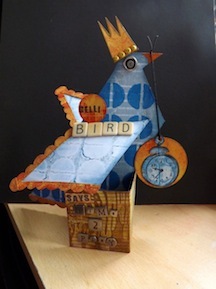 Just love that, and as you can see from the aforementioned debris, I have other ideas for using parts of the die-cuts in interesting ways. So now I am sure the folds work well, and the words are the right length, I’ll make a full page and add it for download probably tomorrow – if I finish it up today. I am thinking the same phrase, as it is so useful, in a variety of colours in addition to black and brown. 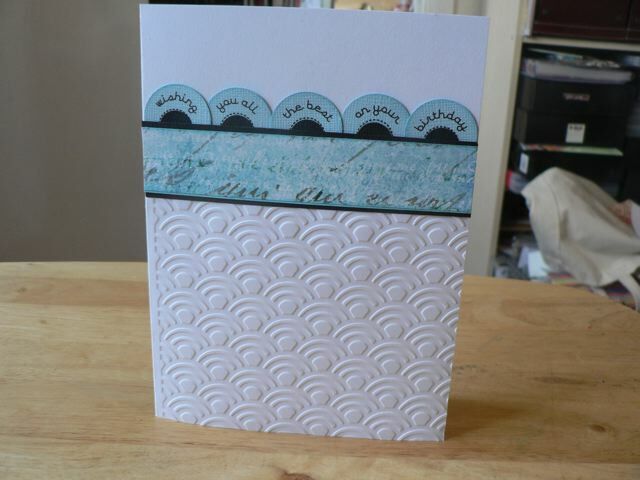 I am thinking that today I want to add some little red circles to the blank circles on the card. Just not sure if the dot will add punch to the card or detract. I’ll test it out and see and maybe add a new version tomorrow as well. I always seem to have so much to do on a Weds. And another crop this weekend, loads of admin over on UKS keeping me busy, and luckily a handful of ideas rattling around in my head to play with. See you at yours later in the day! Remember how I mentioned yesterday that I make the mistakes so you don’t have to? I wanted to say a little bit more about the punch placement to make things easier for you. The text curve on the motifs fit the folds if you punch with the text just under the punched edge at the top. Sorry about the little extra cut on show – taking a photo with one hand while holding the punch in the other is not easy LOL! But can you see how the curve of the text is pretty close to the cutting edge? If you shift the text down too far, what will happen is you will be left with a set of petals that don’t really fit when you try to join them. Can you see the gap there on the right? If I made the folds any tighter so they fit, the first and/or last letter of the text curve might be covered. Can you see how much space I have over the text? Too much. Shifting that ever so slightly, you can see the petals DO fit much better. 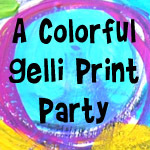 I’ll be adding this to the to post in the Freebie Printables menu in the top bar so all the posts concerning these can be found in one place.